Amazing Value for ONLY £1. 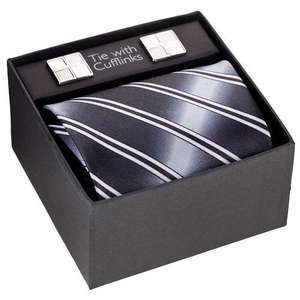 Smart Tie and Cufflinks set. Great for Stocking Filler. Ideal for a day in court for the Chav's! Similar product is available for only 99p ....... at 99p Stores shops. Chav's ?? If you're going be a smart-alec, at least learn when and where to use apostrophies. Chav's ?? If you're going be a smart-alec, at least learn when and where … Chav's ?? If you're going be a smart-alec, at least learn when and where to use apostrophies. This is the internet, don't be so petty about such things. Its not like he wrote a whole paragraph filled with punctuation mistakes. This is the internet, don't be so petty about such things. Its not like … This is the internet, don't be so petty about such things. Its not like he wrote a whole paragraph filled with punctuation mistakes. seen this myself, but did not post as "christmas cracker quality" save yourself a £1 or 99p, not worth it. seen this myself, but did not post as "christmas cracker quality" save … seen this myself, but did not post as "christmas cracker quality" save yourself a £1 or 99p, not worth it. You must have some posh crackers, mine are full of plastic moustaches. Can I come for Christmas dinner? You must have some posh crackers, mine are full of plastic moustaches. … You must have some posh crackers, mine are full of plastic moustaches. Can I come for Christmas dinner? See you all in pedants corner. 1. It is not petty. 2. It is not difficult to use punctuation correctly. 3. It is funny because an attempt at one-upmanship failed due to incorrect punctuation. Everybody makes mistakes but an attitude that allows them to go unchallenged because, as you say, this is the internet, will mean that written English on the internet continues to decline to the point where meaning is lost or misunderstood. Pedants' corner, surely? :3Sorry, I couldn't resist. 1. It is not petty.2. It is not difficult to use punctuation correctly.3. … 1. It is not petty.2. It is not difficult to use punctuation correctly.3. It is funny because an attempt at one-upmanship failed due to incorrect punctuation. Everybody makes mistakes but an attitude that allows them to go unchallenged because, as you say, this is the internet, will mean that written English on the internet continues to decline to the point where meaning is lost or misunderstood. Or it would teach people to use the correct spelling and punctuation first time. I ordered and overnight my orDer was cancelled. great if u can get one but I ordered mine for 48 quid from amazon. wish now I has bought more to sell! I ordered and overnight my orDer was cancelled. great if u can get one … I ordered and overnight my orDer was cancelled. great if u can get one but I ordered mine for 48 quid from amazon. wish now I has bought more to sell! What the hell are u on about? Quite rightly pointed out - unacceptable in this day and age. I particularly hate it when people don't know the difference between "you're" and "your" as well. Quite rightly pointed out - unacceptable in this day and age.I … Quite rightly pointed out - unacceptable in this day and age.I particularly hate it when people don't know the difference between "you're" and "your" as well.There just idiots.